Around this time last year, we started thinking about our travel plans for the coming year. After tossing around a few ideas, we settled on spending our winter months in the southern hemisphere for some sun. 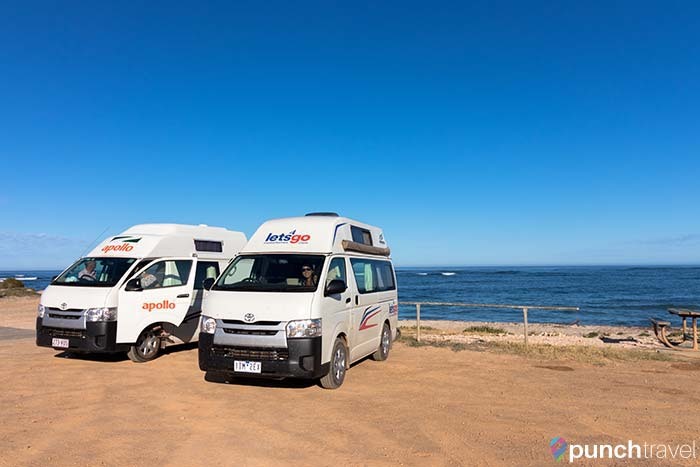 To up the ante, why not spend three months in a campervan driving around Australia? Little did we know though, we were greatly underestimating the task we signed up for. To drive around the circumference of Australia is known as the Big Lap. It is not a feat that is easily completed, and not many people, Australian or otherwise, have undertaken it. To do so requires time and money, something that is not always at one’s disposal. But since we were fortunate enough to meet these two requirements, we decided to go for it. Keep in mind, this was our first time in Australia. It was also my first time traveling in a campervan, and Matt’s last campervan experience was when he was 15 years old. Clearly, we knew what we were doing, haha. How hard could it be? The entire experience took 3 months, and tested our resolve at every turn. It was the best of times, it was the worst of times, but in the end, we were happy to have done it. Ask me in ten years – at least! 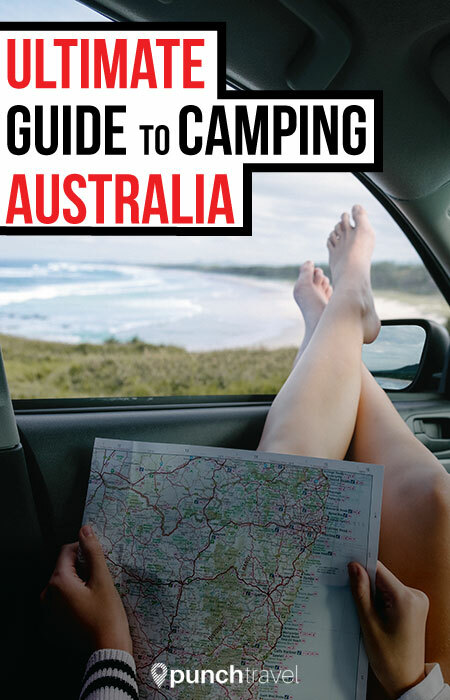 This guide will cover everything you need to know about camping in Australia. We’ll cover what to bring from home, what to buy, where to camp, and how much it’s going to cost. Plus we’ll provide tips and suggestions on how to make your trip more comfortable. Rent or Buy? Rent. 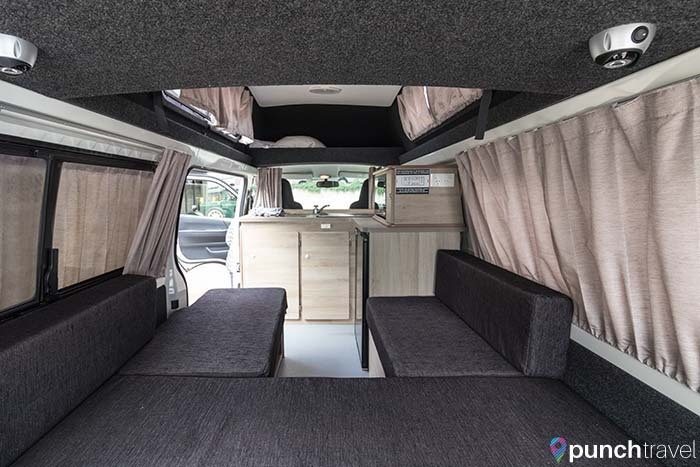 This will come down to what your specific needs are and how much time you plan to travel in the camper van. For us, that meant renting. 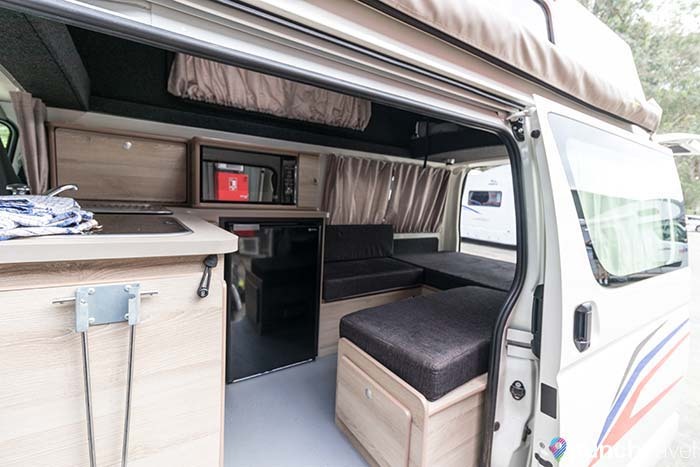 Rental Company: We looked at Apollo Motorhomes, Britz and Go Cheap Motorhomes, but in the end, went with Let’s Go Motorhomes. For a two-person hi-top, they had the best price and the newest vehicles. We were extremely happy with our decision. Insurance: 1,645 AUD We opted for external insurance through RentalCover.com. We found their rate to be more competitive than what the van rental company offered. However this meant having to put a steep 6,000 AUD immediately on our card as a damage deposit. If we had taken insurance with the rental company, the initial deposit would be reduced. Day to Day Expenses: 4,711 AUD. By far our greatest expense was fuel. 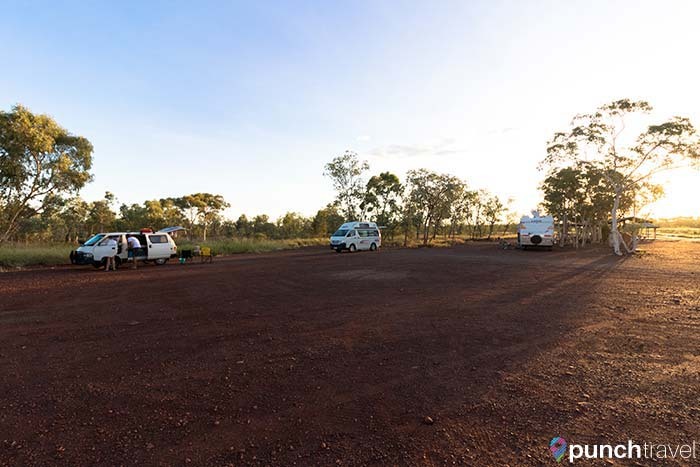 Especially in the more remote areas of Australia, the gas prices could be more than 1.80/liter. E-Reader: To pass the time. Swimsuit: In addition to swimming, a swimsuit is essential for public and outdoor showers. Flat pack water bottle: A flat water bottle will be great for filling up water and cooling off in the fridge. Laptop or tablet: For watching movies. Now that you can download movies and TV shows with Netflix, you can store files and access them offline. Map of Australia: This is very handy to have so that you can scope out where all the attractions are along the way. Hiking/walking boots and flip flops: Most of your time in the van will probably be spent in flip flops but you’ll be grateful for good walking shoes when navigating the desert. Cash: Many remote places in the outback will not take credit cards. Too much clothing: Space is limited in the van, and you’ll find that vanity will go out the window pretty quickly. Same goes for makeup and hair styling. 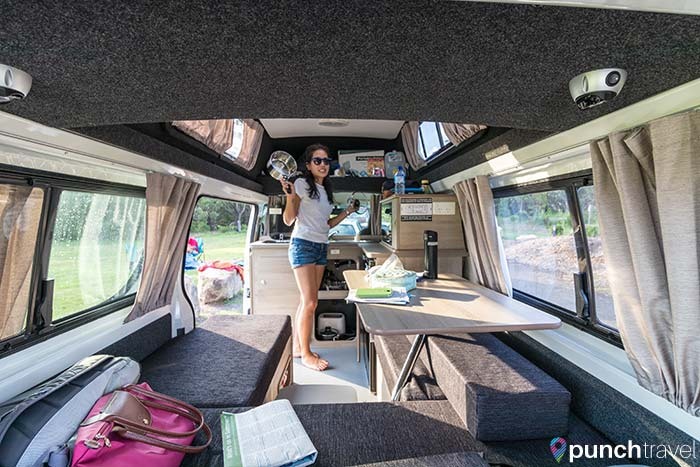 Kitchen cooking equipment: If you are renting your van, it will come equipped with all of these things. Linens and towels: Again, this will be provided by the rental company. GPS: It is pretty easy to get around in Australia and roads are well marked. Investing in a GPS is not necessary, especially if you download offline maps from Google Maps. Sim card: Having a phone for emergencies will give you greater peace of mind. We purchased a 6GB sim card from Telstra, which included unlimited wifi at their nationwide hotspots. 12 volt to 240 inverter: It’s impossible now to not have at least a few electronic devices in your possession and these things need to be charged. And the only way to charge these devices is with the cigarette light in your car. However the voltage needs to be converted in order to charge your precious electronics. This is a life-saver. Portable toilet: Public toilets? No thanks. Not when there is a frog in the toilet. Frog. In. Toilet. Need I say more? Fly net: If you’re traveling anywhere in the center of Australia you’ll want one of these if you want to stay sane. Camp shower: For the times in which you can’t find a shower, fill up this bad boy and hang it over a tree branch (or in a disabled bathroom) and voila – instant shower. Drinking water: And lots of it! Although water taps for filling your van are available at most gas stations and visitor centers, not all of it is potable. Make sure to have at least 10 liters of drinking water per person. CamperMate: This free app is a lifesaver. It lists all campsites (and organizes them by free, cheap or paid) plus where to find showers, toilets, drinking water and more. Plus, the app works offline. WikiCamps: Similar to CamperMate, except it is only free for one month. Google Maps: Download offline maps to navigate with GPS if you do not have a data plan. 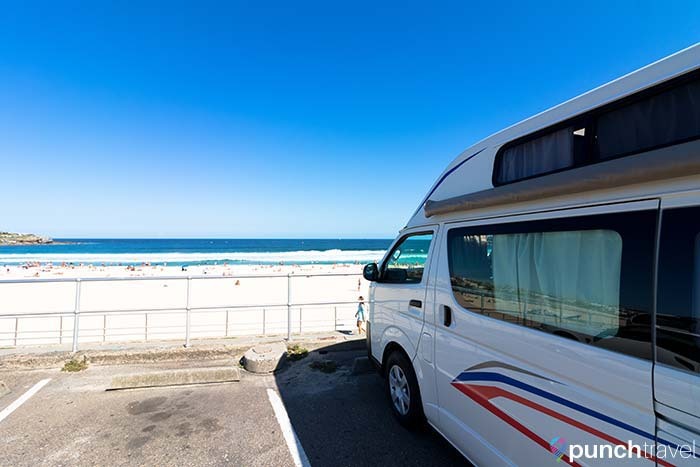 The campervan high season in Australia is from December to February. Prices will be more expensive and the roads more crowded. However when you go will really depend on where you will go. The weather and climate changes rapidly across Australia. Australia is obviously a huge country and it takes time to explore all of it. 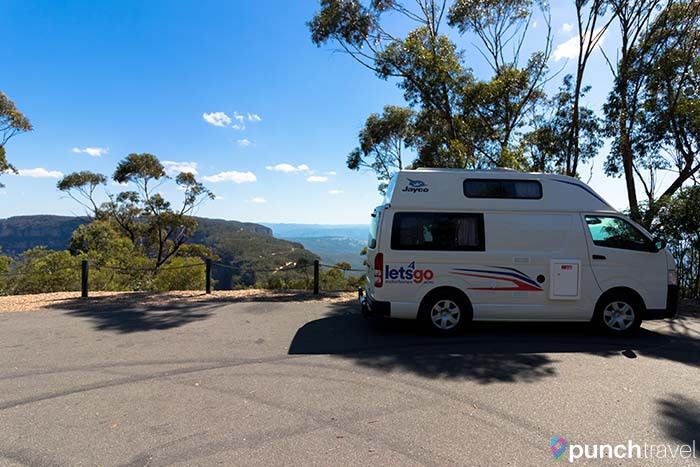 Whether you only have a few days or a few months, there is a road trip in Australia that beckons. It certainly is not as easy as it may seem, but if we could do it, you can too! If you have any questions that were not answered in this post, drop us a line in the comments or email us and we’d be happy to offer our advice.